A human avatar success coach for leadership assessment and development. Select International, a market leader in employee selection and assessment solutions, was looking for a way to dramatically increase engagement for users of their online leadership assessment and development tool, used by large employers to help employees better understand their strengths and weaknesses in the workplace. 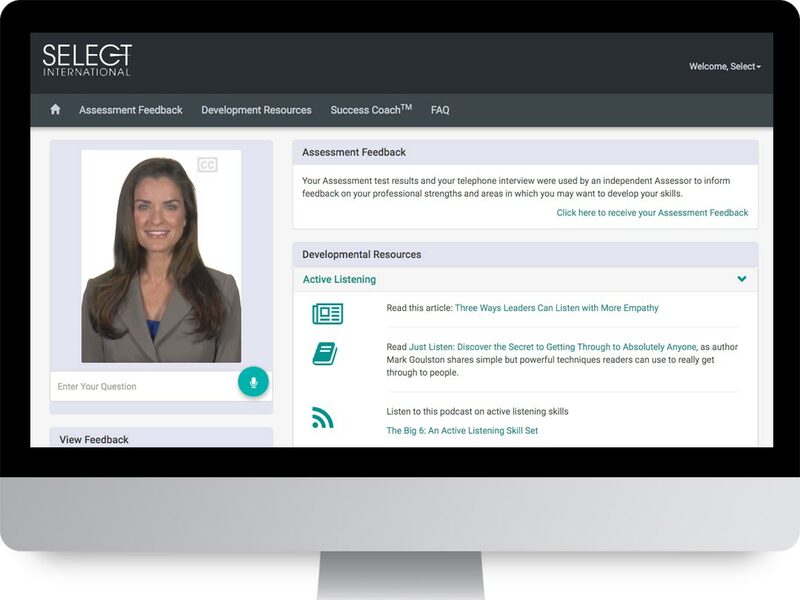 Leveraging our avatar technology to create an engaging, personalized experience, we designed a virtual success coach that helps users maximize the platform’s powerful suite of leadership assessment and development tools. Just like a real “life coach”, the human avatar interacts like a real person as it guides users through an in-depth battery of assessments, communicates across multiple devices, and leverages artificial intelligence to gather, interpret, and deliver data in real-time.